In Bill Bryson’s ‘ The Road to Little Dribbling’, he mentions driving along slow but glorious roads to Torcross, where he walks up a big hill above Tocross village. Quote ‘ The view took in the mighty sweep of Start Bay, which is surely one of the very loveliest in England. To the south an attractive white lighthouse stood on an eminence called Start Point. To the north at Stoke Fleming there was some other tower – a church steeple, I decided – and in between sprawled the most exquisite, effortlessly perfect combination of fields, clustered villages, farmhouses and wandering roads’. The field where he must have stood to take in the view is next to Greyhomes. 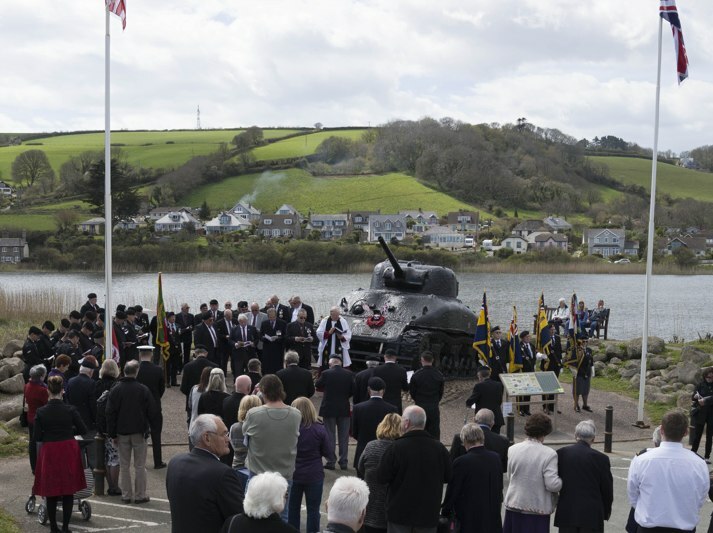 In April at Torcross there is a memorial service for the 946 men who lost their lives on 27 & 28 April 1944 during Exercise Tiger, the practice landings for D day here at Slapton Sands. Exercise Tiger was forgotten after the war until the Sherman Tank was dragged from the Bay by Ken Small in 1984 and placed in Torcross car park as a memorial to the men who lost their lives. Now they are remembered every year. This winter has seen a relentless conveyor belt of winds from the South, depleting the beach in front of Torcross and last Saturday saw these rough seas on a big tide lashing the village sea front. Luckily the houses did not suffer any severe damage but the Dartmouth – Kingsbridge road got severely undermined just outside the village. The road is now open, diverted through the car park, work repairing the damage will start soon.